We had a blast celebrating our sweet sixteen with you last night! Thank you so much for coming out to share such a special time with us. We are so lucky to have such dedicated, passionate, and supportive fans like you. If it wasn’t for your unconditional love over the years, we wouldn’t have decided to return, release new music, and simply bring more DD into your life (and our lives too)! We’ve got a lot of cool things planned for the future and we are so excited to be on this journey with you again. THANK YOU for all the love you’ve given us over the past 16 years. It’s truly your love that keeps DD’s heart beating strong. Stay tuned, and see you soon! P.S. Check out photos from our show on our Facebook page! 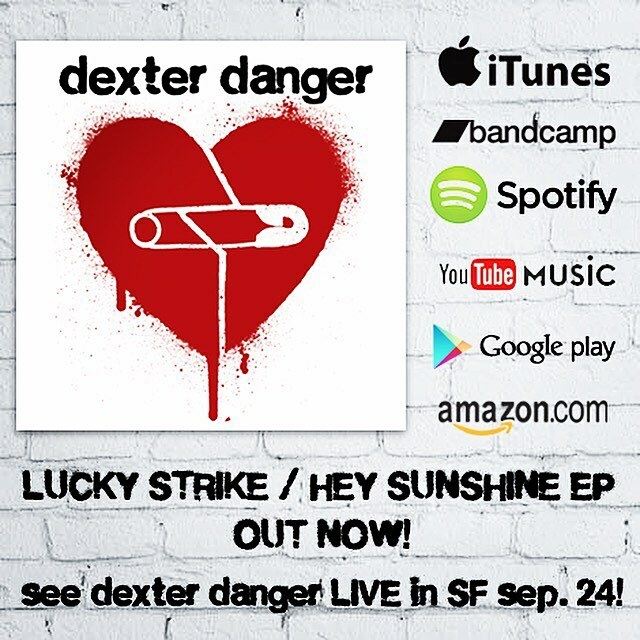 This entry was tagged 2016, Aymen Trouble, Dexter Danger, Hey Sunshine, Lucky Strike, San Francisco, show. Bookmark the permalink. Listen to “Lucky Strike / Hey Sunshine” on iTunes and Spotify! We are all over the interwebz! Now you can listen to “Lucky Strike / Hey Sunshine” on iTunes, Spotify, Bandcamp, Google Play, and lots more places. Enjoy! This entry was tagged 2016, Aymen Trouble, Bandcamp, Dexter Danger, Hey Sunshine, iTunes, Lucky Strike, new EP, pop punk, San Francisco, Spotify. Bookmark the permalink. “Lucky Strike / Hey Sunshine” EP out July 27! Wanna be the first to get our new EP? We now have it up for pre-order at dexterdanger.bandcamp.com for only $2! Everyone who pre-orders will have the EP automatically sent to their e-mail inbox at midnight on Wednesday, July 27! And if you really wanna be ahead of the game, you can also pre-order the Limited Edition CD of “Lucky Strike / Hey Sunshine” which comes with our Sweet Sixteen Zine and ships on August 31! This entry was tagged alternative, Aymen Trouble, Bay Area, Dexter Danger, EP, Hey Sunshine, Lucky Strike, new, pop punk, punk, rock, San Francisco. Bookmark the permalink.